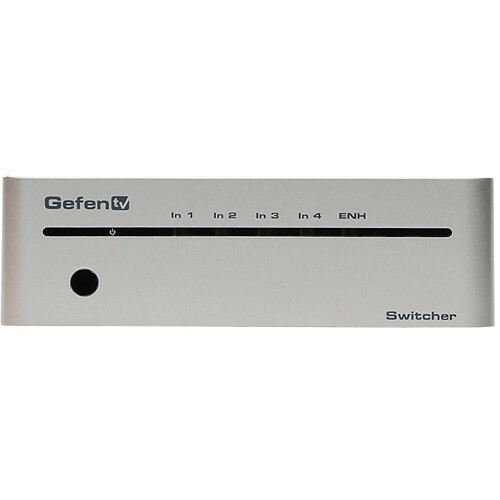 The Gefen GTV-HDMI1.3-441N 4x1 Switcher for HDMI, with RS-232 control, can switch between any of the 4 HDMI inputs to 1 HDMI output. Resolutions up to 1080p Full HD/1920x1200 with multichannel digital audio are supported. It has an auto-switching feature, which will automatically switch to the new source that is connected and revert to the previous input once the current device is turned off or disconnected. Any of the 4 HD sources can be selected via push-button, IR remote control, or the RS-232 control. The switcher supports DVI Sources/DVI Displays with an HDMI-to-DVI adapter, and is Energy Star / HDCP Compliant. It also features LPCM 7.1 Audio, Dolby Digital Plus, Dolby TrueHD, and DTS-HD Master Audio and supports 3DTV Pass-through. Box Dimensions (LxWxH) 11.0 x 9.4 x 5.5"
GTV-HDMI1.3-441N 4x1 Switcher for HDMI is rated 3.3 out of 5 by 3. Rated 1 out of 5 by Brett from Poor Engineering Design Would give this a 0 star if it was possible. I purchased this for my home theater to switch between the kids video game consoles. Was easy enough to set up but the blue lights on the front (that can't be turned off) are so bright they actually light up the projection screen in dark movie scenes (unit is on the side and a good 5 ft. away from screen). If that wasn't a bad enough design, the auto detect feature continuously switches off and there is no way to override this feature so if you are using a port it will be blink off while it searches for incoming signals! Wasted money!!! Rated 4 out of 5 by Billy the Watcher from A real smart DHMI Switcher If you like HD video resolution, this is the ideal solution if you have more HDMI-capable devices than HDMI inputs available in your TV. It gives you the capacity to plug four HDMI devices into one HDMI TV input. It comes with a small remote control and all the HDMI cables you need for each port. The only design flaw in this switcher is the excessively bright light indicators in the front panel. The lights shine a very intense blue glow that is extremely annoying to the eyes Since you have to place this device - cable-length permitting and in order to use the remote control - somewhere facing you as you watch your TV, there is no escaping this glow. The brightness is very focused toward the viewer and about ten times as intense as a night light. Solution: I had to fashion a strip of the sticky part of a couple of yellow Sticky Notes and place it across the front panel in order to diminish this annoying glow and still be able to see the indicator lights. It makes a big difference to the eyes. Thus, this design flaw cost this product one star in my gizmo firmament. If i switch between hdmi 1 and 2 (for example), there's some black image? Or it cut directly, without a black image?